Series of LED lamps integrate Indium Gallium Aluminum Phosphide and Silicon Carbide/Gallium Nitride LED technologies, 25mm Edison screw bases and light-maximizing designs. The solid-state units are resistant to electrical and mechanical shocks, vibrations, frequent switchings and environmental extremes. • Draws from minimum of 1.2W to maximum of 2.7W • Voltages from 12V to 240V AC • Wavelengths of 850nm, 880nm, and 940nm • Integrated current-limited resistors and polarity protection diodes • Available in green, white, blue, yellow, red, and orange. With an average LED life span of 100,000-plus hours (11 years), LEDs operate reliably year after year. Solid-state design renders LEDs impervious to electrical and mechanical shock, vibration, frequent switching and environmental fluctuation. Integrated current-limited resistors prevent short-circuiting. 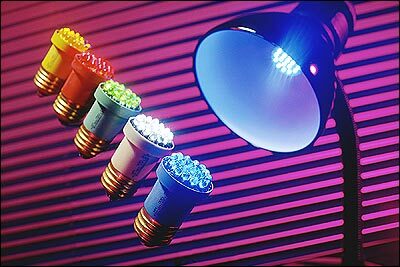 LED lamps use only 10 to 20 percent of the energy consumed by equivalent incandescent lamps that, when combined with their maintenance-free operation, results in substantial cost savings. For additional information on incorporating Task/Spotlight LEDs into your product designs, contact LEDtronics toll free at 1-800-579-4875, telephone 310-534-1505, fax at 310-534-1424, click here to email us or mail at LEDtronics Inc., 23105 Kashiwa Court, Torrance, CA 90505. Visit our website at www.LEDtronics.com.